Okay, so we have made it to week three! This week was a tough week mainly because I overdid my Sunday run and hurt my left leg. I had a knot in my calf the size of my fist. Unbeknown to my partner, Rebecca, I started to have an intimate relationship with a foam roller and a bag of ice. I can honestly say in my entire athletics career I never once used a foam roller. It’s an experience, I can tell you! I had to YouTube how to do it right and felt bad for the neighbours as I was making noises I can only describe as sounding like a cat being strangled. If they had knocked on the door I really don’t know what I would have said. “Sorry, I was rolling round on this” (and then point to a giant blue foam roller). I’m not sure they would have believed me. I think they might have phoned the police. Anyway, the foam roller (my new lover) got me through the week. I’m at the point where I am starting to feel better about my running. I’m feeling more normal and not running like an alien or Phoebe from Friends! I was still really worried about injuries but mainly because everyone kept saying ‘be careful you don’t get injured’, which most definitely makes you think about it more! I feel like I have a good plan, which is to run when I can and enjoy it. 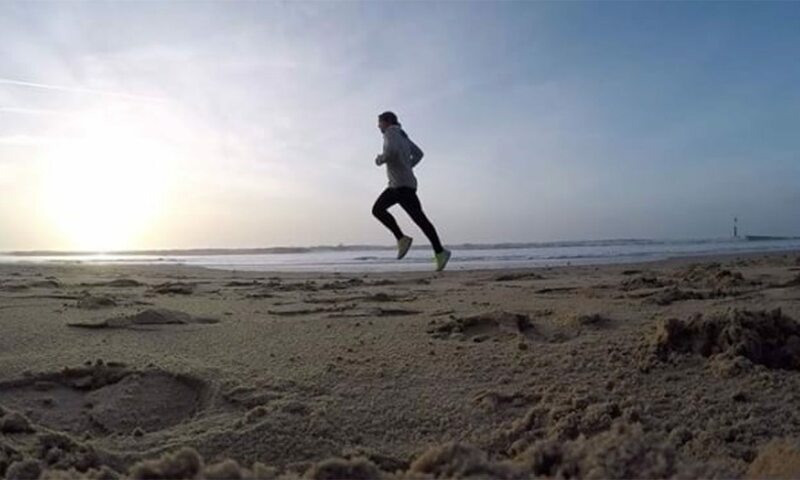 It’s a Running montage, a little one from the beaches of bournemouth! Everything is staring to come together! Hope you enjoy! Everything is better with a montage ?????? Happy Sunday!! ??? Also, this week I locked down my diet. I was in a new world of nuts, veg and fruit… what is this stuff? I have come to realise that I am a massive creature of habit. I love the same things every day. Same run, same food, same everything. So, I stuck to it. Greek yogurt in the morning with chopped hazelnuts and honey and coffee, of course. Lunch was sushi, dinner was chicken and veg. A few bananas and apples thrown in there throughout the day. It took me a long time to actually understand what this means. I know some people will get it straight away, but please bear in mind that I once forgot how to spell my own name and called myself ‘Olin’ instead of ‘Colin’. True story! I was the kind of person that would say, ‘I will run tomorrow’, ‘I’ll do my core after my run tomorrow’. I always thought I’d done enough to deserve to put it off. That is never true, I know that now! Don’t be a ‘tomorrow’ person. Be a ‘get it done’ person. Have your goals, whatever they are, and fight for them because no one else will. No one cares if you put it off to tomorrow, only your waistline does. Have a great week guys and thank you for the support!